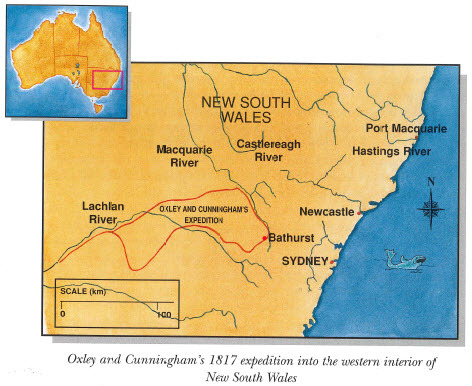 Continuing our series on the local counties of the early colony of New South Wales, this post focuses on the county of Cunningham. 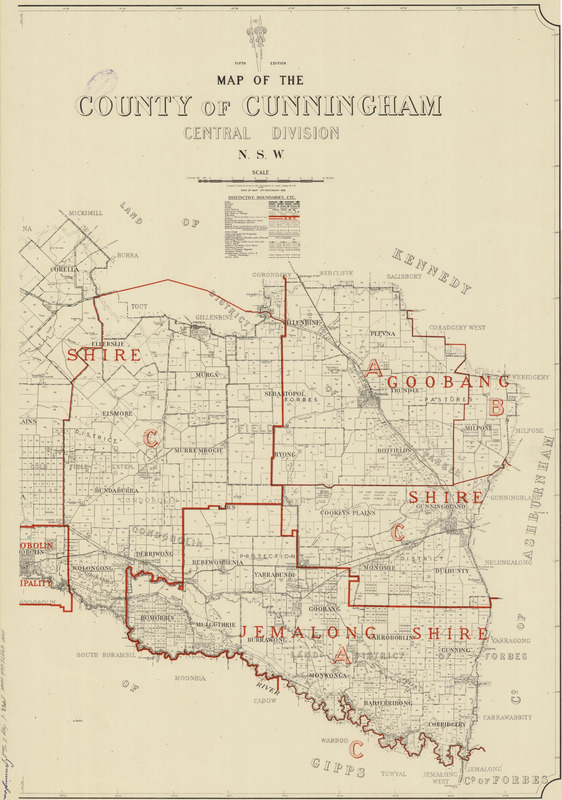 Part of the 141 counties of New South Wales, Cunningham was proclaimed a county in 1862 (the same year as Kennedy became a county and twelve years after the establishment of Ashburnham county) (Atchison, J.F. (1980) pages 39-42). 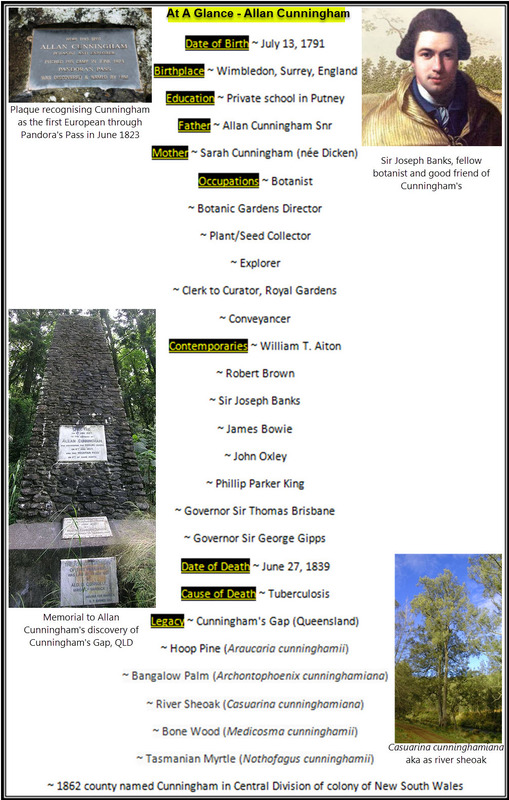 Another intrepid explorer of Australia, Cunningham did not set out to be an explorer. Like his colleague, Sir Joseph Banks, Cunningham was a botanist who discovered that exploring allowed him greater access to new plant species. In 1825 Royal Instructions were issued to Governor Brisbane ordering a general survey of the colony of New South Wales and its division into counties and parishes. County and parish maps have been used for over 150 years to record Crown land dealings. Two sets of county, parish and town/village maps were created and maintained by the Department of Lands and its predecessors. One set of maps, for a particular area, was kept at the Local or District offices and a duplicate set for the whole State was kept in the Head Office of the Department. Both sets were annotated to show changes in the status of the land. 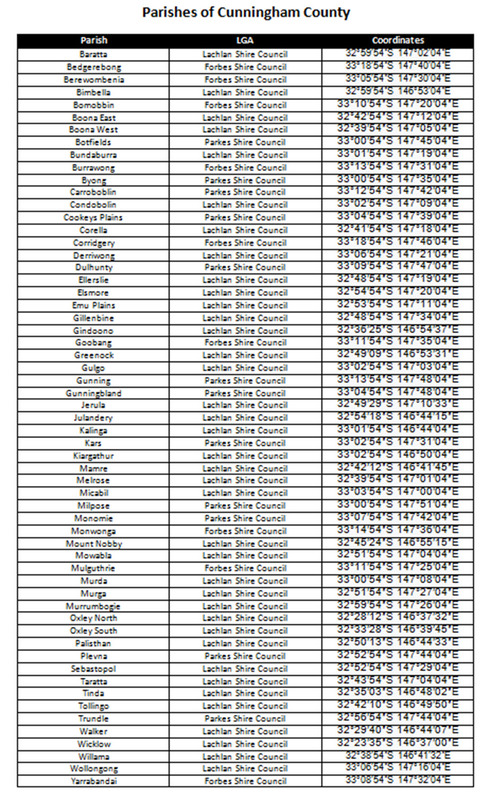 The District Office maps, however, often contain information not recorded on the Head Office versions. Once a map could no longer be easily annotated it was ‘cancelled’ and a new edition printed. …the law was not to his liking and in 1808 he accepted a position at the herbarium at Kew as clerk to the curator of the Royal Gardens, William T. Aiton (1766-1849), then completing work on the second edition of his father’s Hortus Kewensis, 1-3 (London, 1810-13). At Kew Cunningham met Robert Brown, who had been botanist in the Investigator with Matthew Flinders and then librarian to Sir Joseph Banks, and on Banks’s recommendation was appointed a botanical collector to the Royal Gardens. 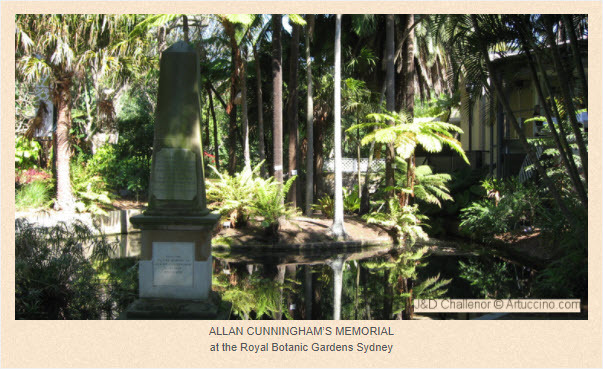 When Cunningham arrived in New South Wales, all matters botanical were his priority. He was yet to realise his affinity for exploration and although accompanying famous explorers he was more concerned with collecting specimens. Cunningham arrived at Sydney Cove in the Surry on 20 December 1816. 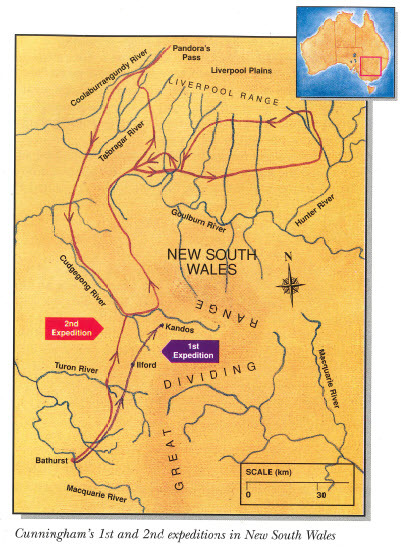 He was received kindly by Governor Lachlan Macquarie who suggested that he join John Oxley‘s projected expedition into the country west of the Blue Mountains: this was arranged and while awaiting departure Cunningham rented a cottage at Parramatta and botanized in the surrounding district. He left Parramatta in April 1817 and returned in September having accompanied Oxley to the Lachlan River marshes and collected specimens of about 450 plant species. The last four months of 1817 were spent preparing these specimens for dispatch to Kew [Gardens], in more collecting around Parramatta, and in preparing to join Phillip Parker King‘s voyage to the north and north-west coasts of Australia in the cutter Mermaid, which sailed from Sydney on 21 December 1817. This voyage took him to Twofold Bay, King George Sound and to Exmouth Gulf whence the coast to Port Walcott (Cossack) was examined, Cunningham having frequent opportunity to land and collect specimens. From Port Walcott the party went to the north coast of Arnhem Land and explored it westward from Goulburn Island and the King River, around the Cobourg Peninsula and into Van Diemen’s Gulf as far as the West Alligator River. The Mermaid visited Melville and Bathurst Islands, called at Timor and the Montebello Islands, and anchored in Sydney Cove on 29 July 1818. During this voyage Cunningham collected specimens of about 300 species, including many new ones from Arnhem Land. Cunningham saw himself as a botanist first, and explorer second. He referred to himself as “the botanical traveller” (Jensen 1996 page 7) just before setting off on the first of five journeys with Lieutenant Phillip Parker King. King had been instructed to survey and explore parts of the coastline not previously investigated by Captain Flinders. He was also expected to examine the rivers, vegetation, and settlement potential of the country behind the jagged coastline. 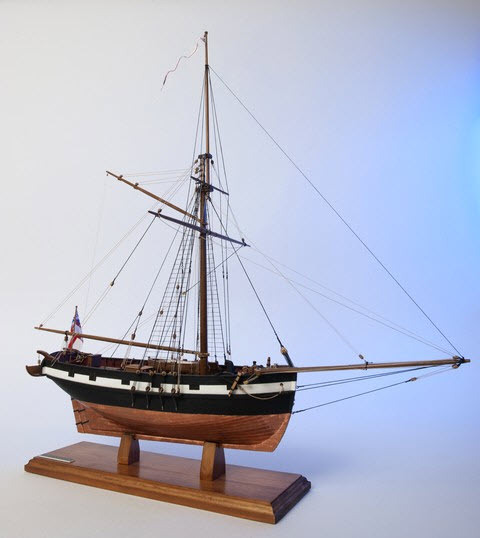 All but one of the voyages would take place in the Mermaid, a tiny teak cutter whose quarterdeck was so small that when all the boats were aboard it was barely four paces long. King had been instructed to carry out the charting of the coast between North West Cape and the western entrance of the Gulf of Carpentaria, and on 22 December 1817 the Mermaid sailed out of Port Jackson. 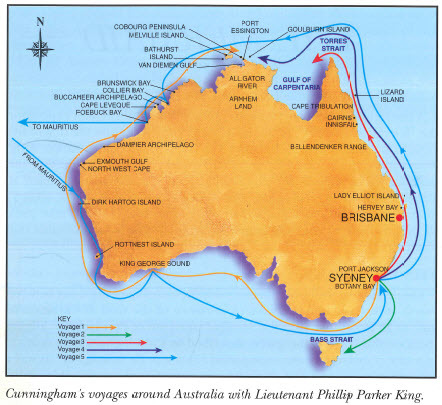 Joining them on this trip was Bungaree, described by Cunningham as “…a chief… of a tribe of Broken Bay who accompanied Flinders in the Investigator”. It was a difficult voyage, and the Mermaid was almost sunk as the ship sailed through Bass Strait before reaching King George Sound. Cunningham collected specimens in the region around the Sound, and he also left some behind, planting a small garden of fruit and vegetables. After leaving King George Sound the Mermaid sailed up the west coast to North West Cape, down into Exmouth Gulf, and then north-east through a sea afloat with water snakes, large turtles and small whales. Deck temperatures reached 48°C, the men suffered from dysentery, and the water shortage was so acute that Cunningham noted “it became necessary to reduce our daily allowance to a gallon a day per person”. It was during this voyage among the islands of the Dampier Archipelago that the Europeans “kidnapped” an Aborigine as he paddled his canoe. Eventually they returned the man to the shore, where his companions seemed quite friendly but weren’t particularly helpful when asked for fresh water. The Mermaid sailed onwards to the north coast of Arnhem Land, stopping at Goulburn Island, travelling around the Cobourg Peninsula and stopping at Port Essington. By 27 April they were exploring Van Diemen Gulf. Cunningham joined King in investigating a river channel, but he didn’t get much collecting done since the river was filled with crocodiles “whose terrific ghastly heads appeared occasionally on the surface of the river”. Believing they were alligators King called the watercourse the Alligator River. In May they discovered the straits that separated Melville Island from the mainland, and Bathurst Island from Melville Island. By the time they anchored in Sydney Cove on 29 July 1818 one of the seamen had died from dysentery, and Cunningham was very relieved to be home. Despite the heat and illness he had accomplished a great deal, returning with collections of around 300 species, including many new specimens from Arnhem Land. “…found a group of natives, who told how a white man had camped with them on the Bogan some months before, and how they had murdered him because his behaviour at night aroused their suspicion. Cunningham’s health deteriorated to the extent that he was unable to sail with Captain John Wickham on the Beagle to the north-west coast. 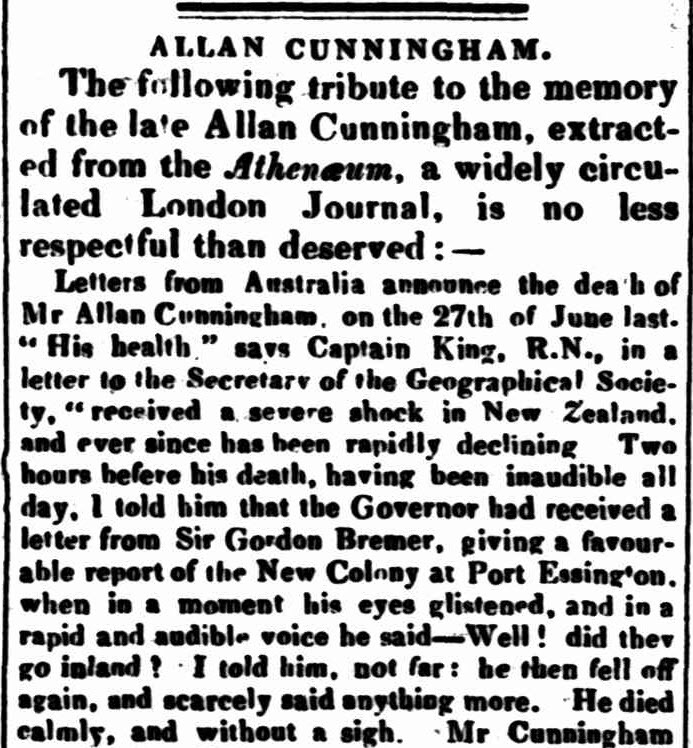 On June 27th, 1839 Cunningham passed away in Sydney from tuberculosis. “Alas, poor Allan! 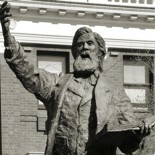 He was a rare specimen – quite a genus of himself; an enthusiast in Australian geography; devoted to his own science, Botany; a warm friend, and an honest man; and, to crown all, when the time came, he resigned himself into the arms of his Saviour, without a murmur.” Captain Phillip Parker King R.N. If you have stories of Cunningham county that you are willing to share please contact Parkes Shire Library via library@parkes.nsw.gov.au so that they can be shared and kept for posterity on this blog. Alternatively you may leave comments on this page. 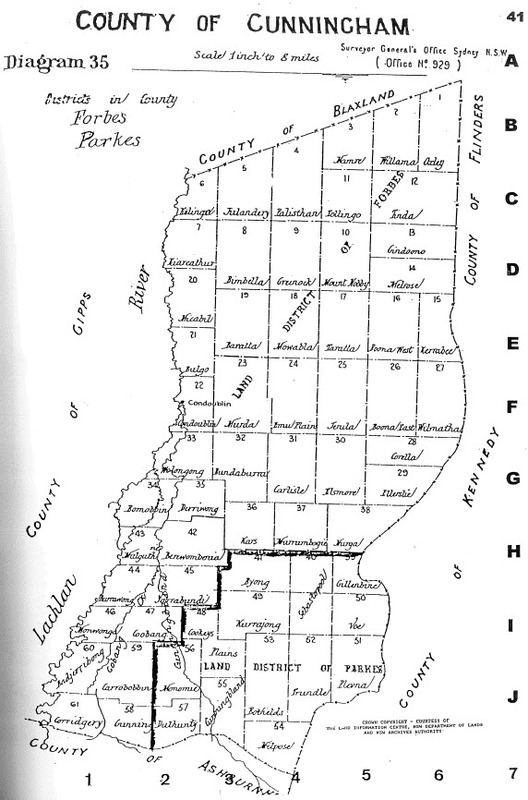 Atchison, J F. “The Counties of New South Wales.” The Australian Surveyor, vol. 30, no. 1, Mar. 1980, pp. 39–42., https://statelibrarynsw-my.sharepoint.com/personal/shr_dds_sl_nsw_gov_au/Documents/DDS%20Root/DDS%20Shared%20Items/11-01-2018/000759.pdf?slrid=0a5e3f9e-2043-4000-ee5e-d1e383e32d50. Document Supply Service. 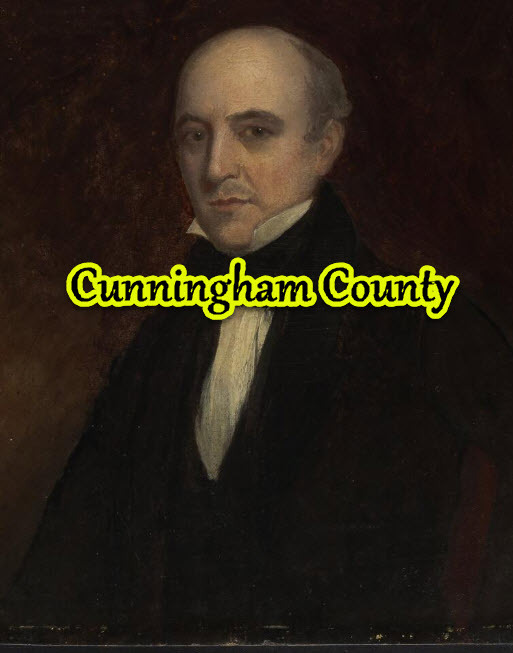 This entry was posted on January 25, 2018 by parkeslibrary in 1820s, 1830s, 1840s, 1850s, Aboriginal, Allan Cunningham, Brief Background to the Maps, Cuninngham County, Cunningham County, General history, Gunningbland, local historical articles, Settlement in Parkes, The Botanical Traveller, Trundle, Tullamore, Uncategorized, Wiradjuri and tagged 141 counties, 1823, 1862, A.Cunn, Alice Jansen, Allan Cunningham, Allan Cunningham Memorial, Allan Cunningham obelisk, Allan Cunningham Snr, araucaria cunninghamii, archontophoenix cunninghamiana, Arnhem Land, Ashburnham county, Australia, Australian Dictionary of Biography, bangalow palm, Baratta, Baratta Parish, Bass Strait, Bathurst Island, Bedgerebong, Bedgerebong Parish, Berewombenia, Berewombenia Parish, Bimbella, Bimbella Parish, Bogan River, Bomobbin, Bomobbin Parish, bone wood, Boona East, Boona East Parish, Boona West, Boona West Parish, Botanic Gardens Director, Botanical Traveller, botanist, botany, Botfields, Botfields Parish, Brazil, Bundaburra, Bundaburra Parish, Bungaree, Burrawong, Burrawong Parish, Byong, Byong Parish, Cape Town, Captain John Wickham, Carroboblin, casuarina cunninghamiana, Charles Fraser, Charles Frazer, clerk to curator, Cobourg Peninsula, colonial settlement, Condobolin, Conveyancer, Cookeys Plains, Corella, Corridgery, counties of colonial NSW, County & Parish Maps, County & Parish Maps of NSW, county of Cunningham, Cunningham County, Cunningham's Gap, Dampier Archipelago, Darling Downs, Department of Lands, Derriwong, Devonshire Street Cemetery, Dulhunty, Ellerslie, Elsmore, Emu Plains, Exmouth Gulf, exploration, explorer, Forbes Shire Council, George Evans, Gillenbine, Gindoono, Goobang, Goobang Shire, Goulburn Island, Government Cabbage Garden, Governor Brisbane, Governor Gipps, Governor Lachlan Macquarie, Greenock, Gulf of Carpentaria, Gulgo, Gunning, Gunningbland, herbarium, history, HMC Mermaid, HMS Beagle, HMS Duncan, hoop pine, Illawarra region, J F Atchison, James Bowie, Jerula, John Oxley, Julandery, Kalinga, Kars, Kennedy county, Kew, Kew Gardens, Kiargathur, King George Sound, King River, Lachlan River, Lachlan Shire Council, LGAs, Lietenant Henry Zouch, Lieutenant Phillip Parker King, Lincoln's Inn, Linnean Society, Liverpool Plains, London, Mamre, Matthew Flinders, medicosma cunninghamii, Melrose, Melville Island, Micabil, Milpose, Monomie, Montebello Islands, Monwonga, Mount Nobby, Mowabla, Mulguthrie, Murda, Murga, Murrumbogie, nothofagus cunninghamii, NSW State Archives, Oxley North, Oxley South, Palisthan, Pandora's Pass, Parkes Shire Council, Parramatta, Phillip Parker King, plant collector, Plevna, Port Jackson, Port Walcott, Putney, Richard Cunningham, Rio de Janeiro, river sheoak, Robert Brown, Royal Botanic Gardens, Royal Gardens, Sarah Dickin, Sebastopol, seed collector, Sir George Gipps, Sir Joseph Banks, Sir Thomas Brisbane, Sir Thomas Mitchell, south-west London, State Archives & Records, State Library of New South Wales, Surrey, Sydney Cove, T M Perry, Taratta, Tasmanian myrtle, The Allan Cunningham Project, the Maldives, Timor, Tinda, Tollingo, Trundle, tuberculosis, Twofold Bay, Van Diemen's Gulf, Walker, West Alligator River, Wicklow, Willama, William T Aiton, Wimbledon, Wollongong, Yarrabandai.